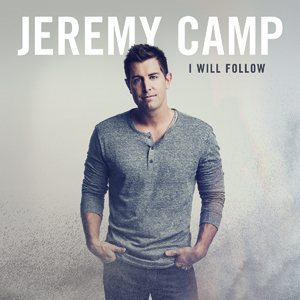 Jeremy Camp has released his new album 'I Will Follow'. In an incredible decade-long career, Jeremy Camp has earned accolades that most artists only dream about. The list includes 5 RIAA Gold albums, over 3.5 million albums sold, a Grammy nomination, 3 American Music Award nominations, 5 Dove Awards, 4 ASCAP 'Songwriter of the Year' Awards and a total of 32 Number 1 radio hits across all formats. Read More Jeremy Camp has released his new album 'I Will Follow'. In an incredible decade-long career, Jeremy Camp has earned accolades that most artists only dream about. The list includes 5 RIAA Gold albums, over 3.5 million albums sold, a Grammy nomination, 3 American Music Award nominations, 5 Dove Awards, 4 ASCAP 'Songwriter of the Year' Awards and a total of 32 Number 1 radio hits across all formats. I have always liked Jeremy Camp albums, just never loved them. This album is totally different. Jeremy Camp has always had a great vocal that thumps through the songs. Yet there is something about this album that has really captured my imagination. I just really enjoyed these pop songs. Tracks like Living Word, Till The End and Finally Home are catchy from the moment you first hear them. The latter track sounds like something that pop/rock band Imagine Dragons would have written, and since they were one of my my favorite bands of last summer, I was always going to fall in love with a summer upbeat track like Finally Home. This album has many upbeat, happy, strong pop classics. There are also some wonderful tender moments, like in the elegant and heartwarming Christ In Me and the power ballad He Knows. Fans of Jeremy Camp will adore this album, yet I think this album will also bring Jeremy many new fans. As I said, I have always enjoyed Jeremy's work, but this album takes my liking to a whole new level. All the songs on this album are great pop songs that are catchy, but also have some great themes running throughout. Jeremy has started the year with a massive pop bang.